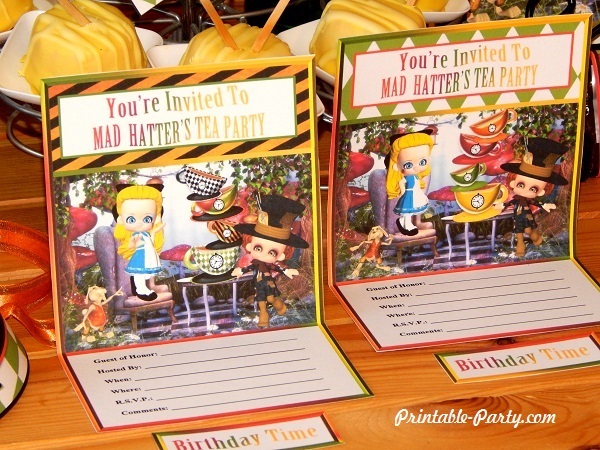 Printable Mad Hatter's Tea Party Supplies that are hand designed & creatively cool. 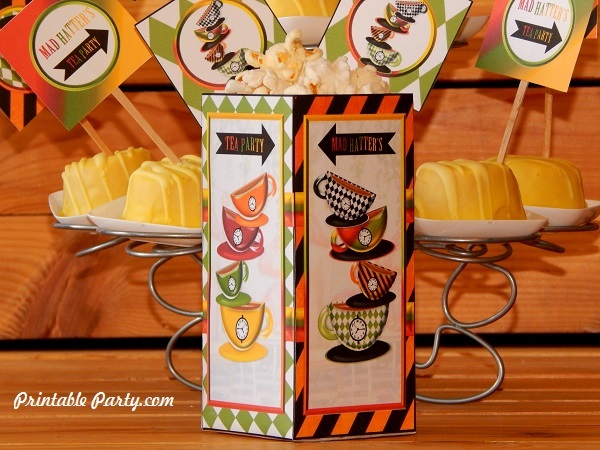 These exclusive & snazzy tea party themed decorations are blasted with bright colors. You'll see a blend of yellow, green, orange, & red. We've added a few patterns of stripes & diamond shapes for style. There are some cool characters too. 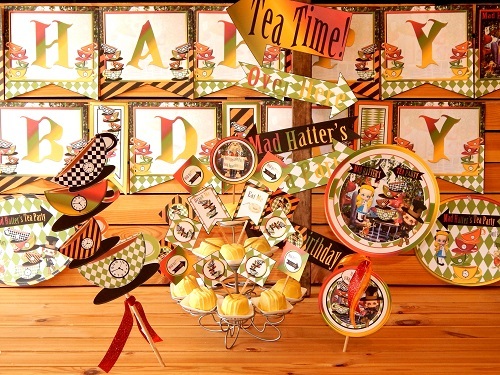 You will find Alice, the rabbit, & the Mad Hatter, having a fun party with huge stacks of colorful tea cups. 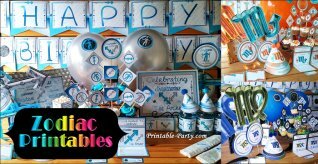 All of our purchased digital PDF party decor files are available to you for download instantly after ordering. You will also receive your files through email to your inbox along with information. All purchased files should be saved onto your computer or storage device for safe keeping. You'll need to have the latest version of Adobe PDF Reader to view, print, or add digital text onto your purchased PDF file invites with the sign tool. 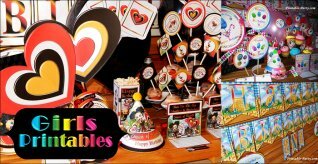 Our printables will print out clear & are made for you to print out using your home or office printer. You can also take the files to your local office supply store for them to print the pages you need to decorate. 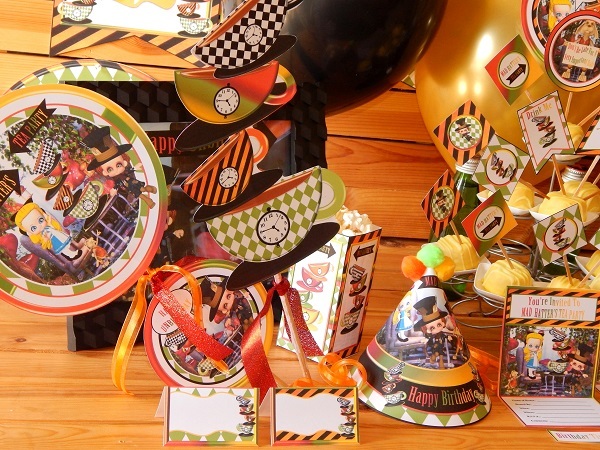 We design our party printables to be printed onto 8.5x11 inch paper. Thick card stock paper looks great & holds sturdy. 65-110 lb works best. 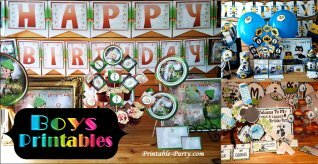 See How Printable Party Works for ordering info. View or FAQ or Contact Us with any questions. 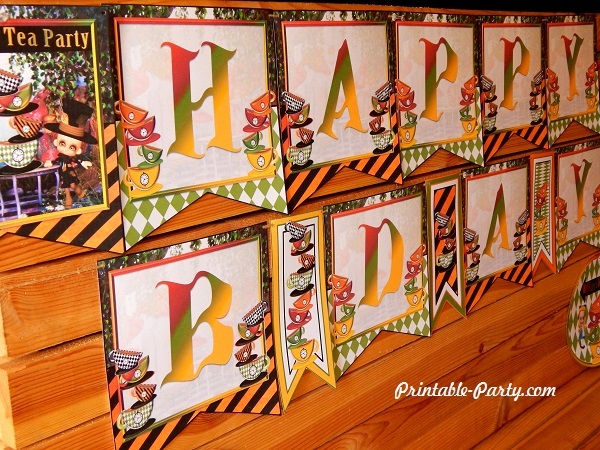 (Unfolded sized is 4.5x7) Invites can be tri-folded or left unfolded. Invites come in 2 designs. These invites fit in envelope sizes A2 folded & 5x7 left flat. 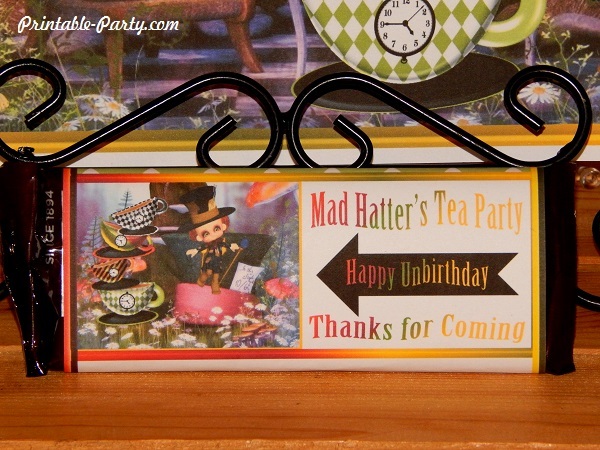 8 Inch printable banner letters that spell out Happy & Unbirthday. 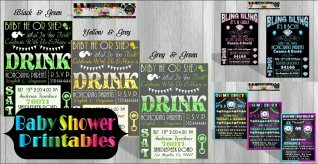 5 Decoration bunting banner designs & bonus 10x8 inch signs in 2 designs. 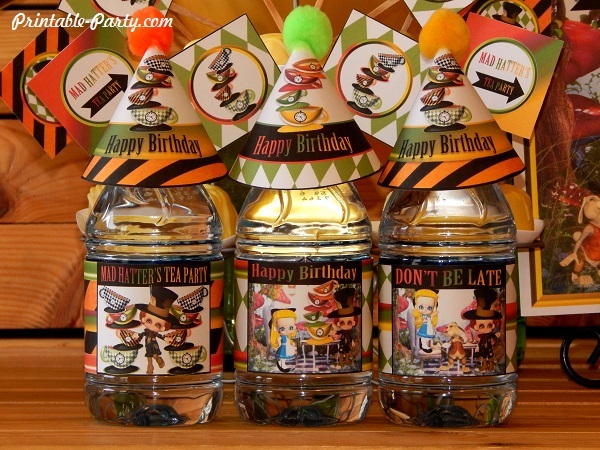 3 printable bottle wrapper designs. Bottle labels will fits great around personal sized bottled & boxed drinks. Very easy to assemble. 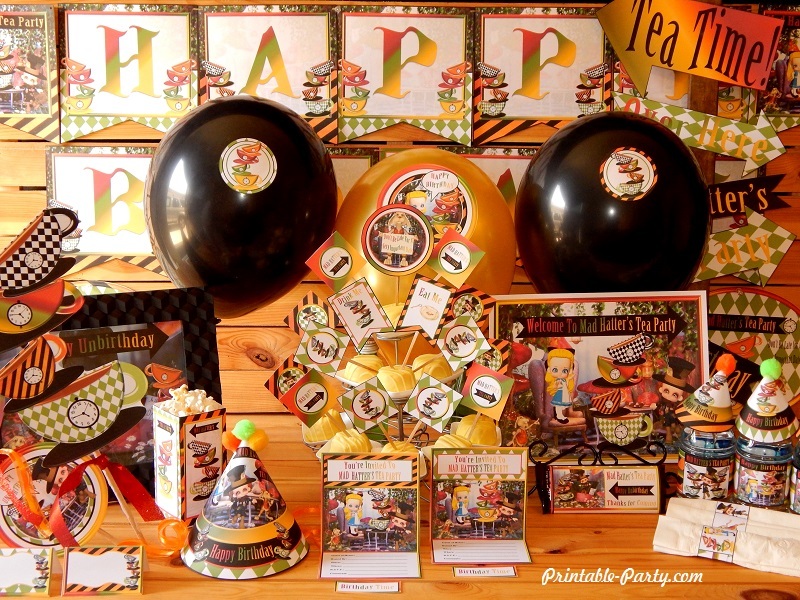 Mini decoration hats are great to use as bottle toppers or for table decoration. 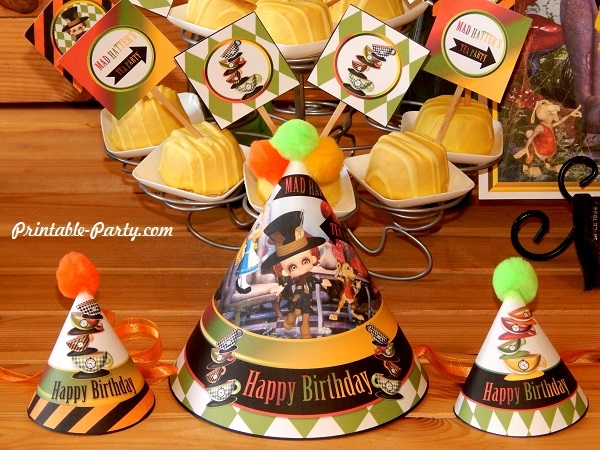 Mini hats come in two printable designs.